For my senior design project at Drexel, I worked with a small team of iSchool students to create a social-mobile application called Coasters that allows users to check-in and share what they are drinking. As the team leader, I pitched this idea and we decided to pursue it into design and development. 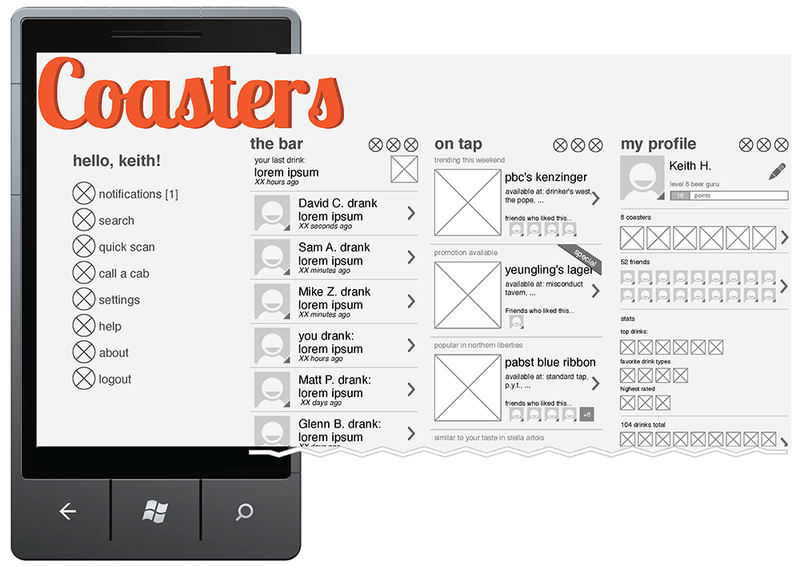 Coasters is a Windows Phone application that allows users to share what they are drinking with friends. Coasters uses a game mechanic to keep users enticed and allows them to earn virtual “Coasters” as achievements. Coasters was awarded an honorable mention as one of the top five teams in the iSchool Senior Design Challenge at Drexel University. While the project began as an Android App, after going through a round of development, we decided as a team that developing the app on the Windows Phone platform would let us have a shorter development period, and I created this second set of wireframes in OmniGraffle in order to show the key design tenants of the app before the development process began. The wires follow the Windows Metro design guidelines to match the platform and to increase the ease of use for Windows Phone users. The five teams with the highest qualifying scores are eligible to participate in the Final Event, where Coasters was awarded an honorable mention.